Hello bakers! Today is a good day, today we’re having blueberries and cream cheese together! I love this combo and this baked good is very special to me as it was the first test recipe I did when I decided to start a blog, as it will be evident when you see the pictures; I decided not to take new pictures of the muffins and keep with the nostalgia and show off how I first started taking pictures for Instagram; it amazes me to see how much better I’ve gotten in such a short amount of time and it makes me look forward what other talents I can hopefully learn from this experience. Behind the Scenes: In case you haven’t noticed by now I like muffins, they’re an amazing breakfast, lunch, snack and pre-dinner dessert if we’re being honest. I love that there’s always a little something extra in a muffin as muffins usually contain two things and I love how hearty they are. As I will tell you plenty of times and as I’ve probably told you enough times already I love hearty food more than I love sweets so when I have to choose between a hearty sweet or candy I usually go for the hearty sweet…….usually. BTS cont’d… In terms of the fruit, blueberries are one of my favorite things to bake with, seriously; not only because they’re usually on sale at the supermarket I shop at, or because they’re healthy, but because they give awesome pungent flavor to just about anything. Cream cheese on the other hand is a blessing amongst blessings with it’s versatility, be it on a bagel, french toast, muffin, cake or anywhere else; that tart yet creamy texture just leaves me speechless and this is coming from a lactose intolerant person (which hasn’t stopped me from eating all this stuff either). Alterations: When I originally went to make this recipe it was strictly supposed to be a blueberry muffin; whenever I decide to make a recipe I use a plain base recipe that has absolutely no flavorings in it that way I would have a blank canvas, I never made a muffin before oddly enough so when I randomly chose this recipe to use it turned out to be dry and crumbly; I usually panic and over-react when things like that happen but this time I was calm, cool and collected and just took out the cream cheese. 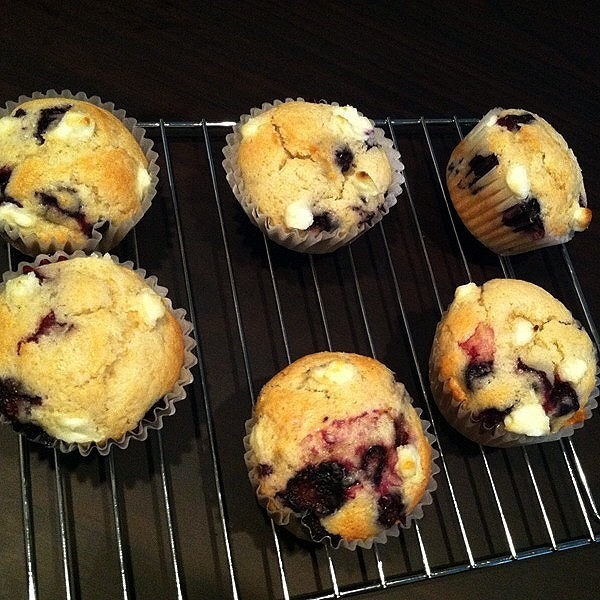 It fixed the recipe automatically and made one of the best muffins in the world. (In my opinion) Funny thing is I still use that base recipe for muffins, the fact that the texture is so crumbly and coarse gives me more leeway to put certain things in there that would usually cause trouble. See how things work out in the end. Overall: Overall I love this recipe, not only because it was the steeping stone to doing this blog but because it really is a hearty dish. As an adult I’m really realizing that breakfast is the most important meal of the day and that four bowls of cereal simply won’t cut it for a full day of school or work, so quick delicious stick to your ribs breakfasts foods like this recipe are a lifesaver. Ta-Ta-For-Now: Well anyway, I hope you enjoy this recipe because it’s a special one in terms of this blog and it’s basically uber delicious! Preheat the oven to 400 F (200 C) and pre-measure out all ingredients. In a medium sized bowl, sift flour, salt, baking powder and mix together. Add the eggs, milk, melted butter and vegetable oil to the dry mixture and proceed to combine all ingredients. The mixture will seem dry and crumbly, don’t worry once you add the cream cheese it will become a better texture. When it comes to scooping out the batter into muffin tins, I like to use an ice cream/cookie scoop that way each muffin tin can has the same amount of batter in it. If you don’t have an ice cream/cookie scooper then a kitchen spoon or tablespoon measuring cup will be fine. 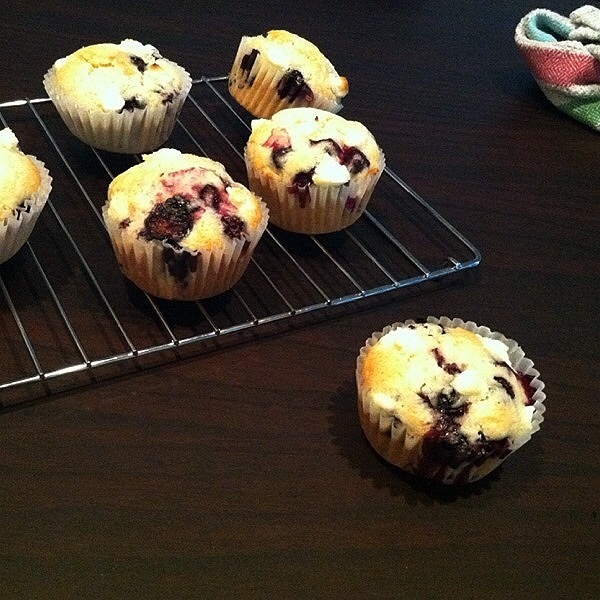 Scoop about 2 ½ tablespoons into each muffin tin. If you want you could sprinkle some fine sea salt on top of each muffin tin to add a great taste to the muffins. I love the taste of a bit of salt on my sweets. In this case I also add some nice vanilla sugar (the inside of the vanilla beans and sugar mixed together) on top and it taste awesome! 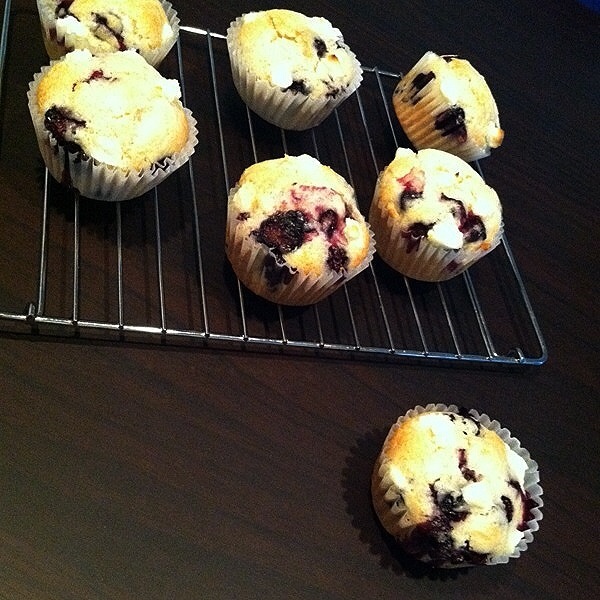 Bake for 15 – 20 minutes (in some case it has taken closer to 25 – 30 minutes depending on how moist the blueberries were), so make sure you keep an eye on the muffins, because each oven is different so yours may need a little less time or a little more time, also this is dependent on how much batter you put in each muffin tin. 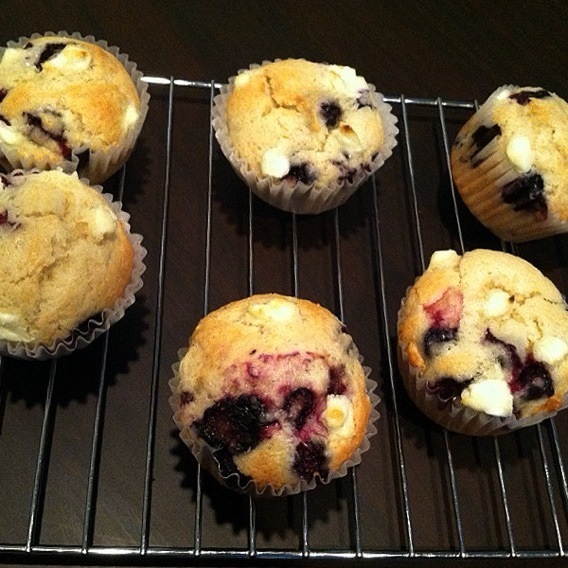 Once cooled, you can enjoy the muffins; it only takes 1 or 2 to become full so that leaves extra. When they start to get a little hard I like to add some chocolate ice cream to them and ugh, I swear it’s like heaven.